TopDesk gives you a respectable amount of options to play with. 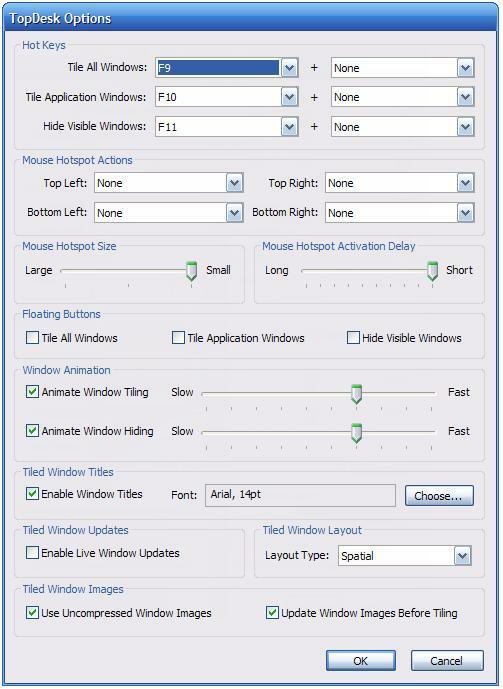 You can select which keys launch the various features, whether or not mouse hotspot activate the features, which windows that TopDesk will tile, the animation speed and some performance items. Any program that essentially takes a bunch of screen shots and does pretty animations is bound to take up some of your system resources. By default the application compresses images and does not update the image each time you use the tiling feature. This gets annoying real quick, as the image no longer reflects what you know should be there. You can have it update each time, but this slows things down considerable. To alleviate this you can turn the compression off, but that just does wonders for the memory foot print of the program. For instance, the program is currently using roughly 35 MB of ram, more than Word, iTunes, Thunderbird or Picasa. Not a huge problem if you have plenty of free memory most of the time, but certainly a fact to consider. Neither is it quite snappy enough, even on a relatively quick notebook (Pentium M 725 with an ATi X300 graphics chip). There is a solution to the performance issues though and it probably should be the default setting for the program. If you select Enable Live Window Updates and make sure Update Windows Images Before Tiling in the options menu you'll find snappy performance and imgages the reflect the current state of the program. Cool beans, thanks for the shout out James. For those of us that know the beauty of multiple monitors, good news. TopDesk supports multiple displays and will use them intelligently. Yes! You might be asking yourself, “Is this all there is? Is there nothing more?” Well, there actually seems to be a whole bucket of Expose clones including Exposer and WinPLOSION. Is TopDesk the best? Seems so for me, but I haven’t tested the other applications extensively. They both cost money ($7 and $9.95 respectively) and have similar features to TopDesk. WinPLOSION felt like the stronger of the competitors, so if you feel like thinking for yourself, grab the trial of it and go for a whirl. There is another, more traditional, alternative. Brought to you by the fine people at Microsoft, part of the PowerToys tools, Alt-Tab Replacement is a little app that will show a collection of thumbnails when you alt-tab rather than the normal icon. Not a true Expose clone, but it does provide a similar function. 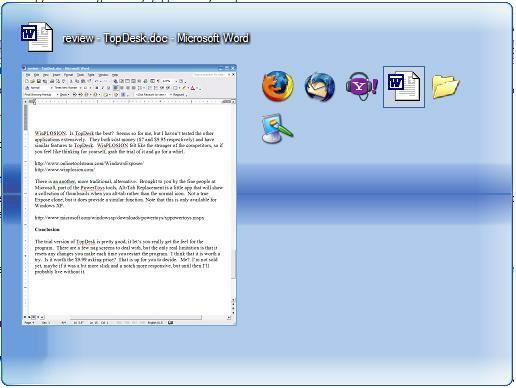 Note that this is only available for Windows XP and doesn't look a 10th as cool. Free though. The trial version of TopDesk is pretty good, the kind of demo I like to see. It let’s you really get the feel for the program. There are a few nag screens to deal with, but the only real limitation is that it resets any changes you make each time you restart the program. I think that it is worth a try. Is it worth the $9.99 asking price? That is up for you to decide. Me? With solid performance and a slick look, I'm tempted.